There are a couple restaurants synonymous with brunch in Chicago. The first is Yolk. And, the second is Bongo Room. On my most recent trip back into the city, Tiffany and I headed to the Bongo Room for a late brunch. Whenever I hear Bongo Room, I think of unique creations that are sweeter than the average breakfast joint. As you will see, their pancake selection is off the chart with names like salted caramel and red velvet being offered as their special hotcake. Overall, the food is tasty, but the sweetness can be overwhelming, even for a person like me (biggest sweet tooth imaginable). The service on our experience was a little sub par, and I can't even blame that on the busy restaurant... because empty tables were everywhere. In terms of dining here on weekends, I will say GOOD LUCK. The wait can be outrageous. All in all, I do recommend trying their hotcakes, but my advice is to SHARE them like a dessert is shared. Because sugar overwhelmed the menu, I had to give a 4-mile rating. Much better than most brunch places, but with such creativity, why couldn't they think of offering a smaller option with savory components as well? I believe Bongo Room was made famous by this specific dish... their Red Velvet hotcakes. These pancakes are made with the traditional chocolatey red velvet batter and topped with a warm vanilla creme and toasted walnuts. The order comes with three which is absolutely outrageous after you have your first bite. This dish just screams sweet and dessert. The pancakes are light and fluffy just like red velvet cake and that vanilla cream reminds you warm liquid icing on a warm cake. I absolutely love eating a couple bites of the meal, but it gets really old really fast. The sweetness starts to be more overwhelming than enjoyable. MY SUGGESTION: make a small order... maybe 4 silver dollar pancakes served with a side of bacon or sausage and an egg? That would be significantly better because you could balance the sweetness with some salty ingredients. It is great to try, but please share it with multiple people so you don't get sick from the sweetness. Luckily, Tiff and I decided to also share an omelette. You can either build your own or choose one of their unique creations. 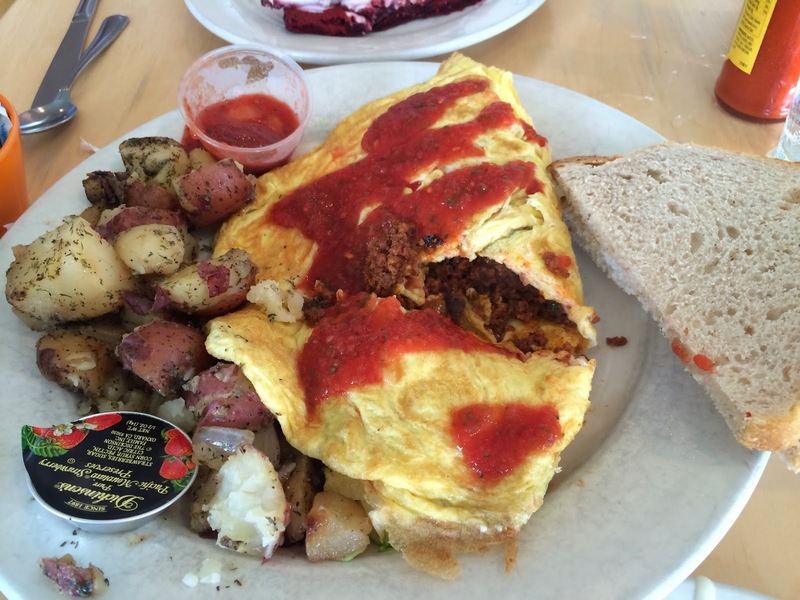 We chose their chorizo potato avocado omelette. It came with just what the name says it has, but it also has queso fresco. A side of salsa, their house potatoes, and a couple slices of sourdough toast make up the rest of the meal. I really enjoyed the meal. The portion was huge, which is standard for most brunch restaurants. The chorizo was not mushy like other places I have had it. In fact, it had more of a ground sausage consistency. Unfortunately, the salsa was nothing special and possibly was from a jar. The potatoes were plentiful, but just standard house grilled potatoes. The omelette was unique, but everything else was nothing special. 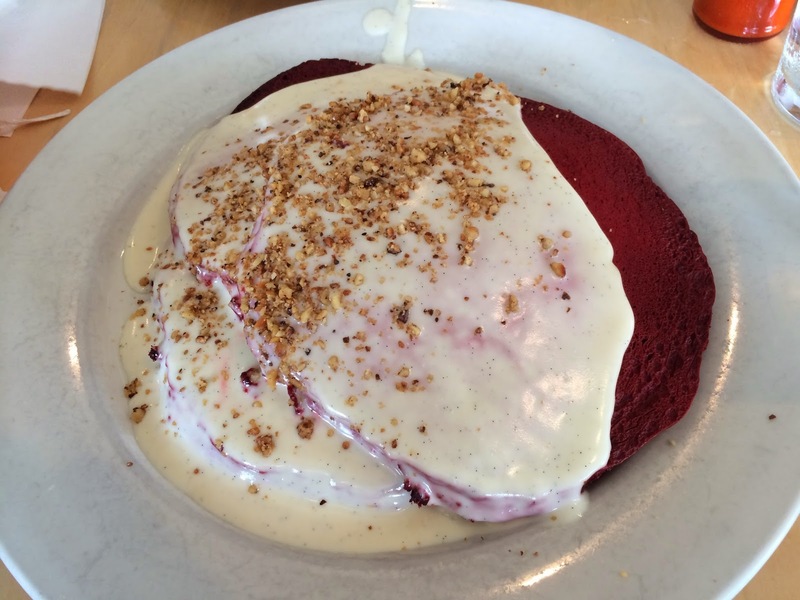 - Red Velvet pancakes are a must try... but make sure you get one for the table and everyone have two or three bites. Anything more is too much. - Weekends are crazy. Don't expect to get in unless you come really early. I have waited for nearly an hour one time and another time I didn't wait the 1+ hour for a table. Craziness. bongo room always has a unique menu. that is very inspiring. they have an unique way to represent old boring dishes into something very inovative.